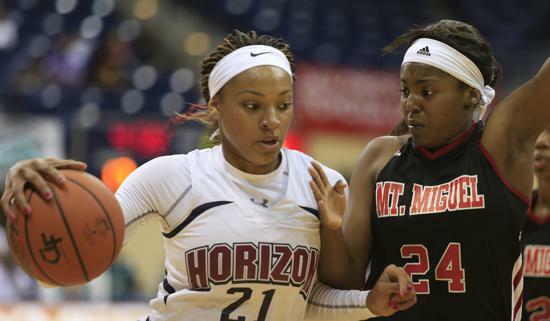 Horizon Christian’s Dijonai Carrington (left) signed with Stanford while recovering from a second ACL injury. Dijonai Carrington took it to heart when her AAU coach implored the team to get back on defense faster. So, on July 25 in Las Vegas, she scored on a layup but came down on the medal support of the temporary basket. Remembering the coach’s words, she scrambled to her feet and raced the other way to prevent a shot. Then she realized hitting that support had injured her right ACL. “I came down right in front of the college coaches who were there,” she said Tuesday, looking back. The next time the coaches who were truly interested in recruiting her saw the Horizon Christian senior, she was wearing a heavy brace on the knee and walking with crutches. Again. Two years earlier she had damaged her left ACL and worked her way back onto the court. This time she had one surgery in August, followed by two more after a possible infection and finally a fourth in October. Carrington, who has signed with Stanford, missed two months of school. After being told it would take six to nine months to recover, the All-State player who averaged 27.4 points and 21.1 rebounds a game last season started wondering not just if she would play again this year, but ever. Instead, the 6-foot Carrington was cleared to play in December, as long as she had no contact. How does someone rebound without contact? Or drive to the basket where bodies, some of them big, are waiting? Those were the things that separated Carrington from a lot of other good players. She doesn’t rebound and drive quite like she did last year. Not yet, anyway, and probably not until February. Carrington has had to change her roles as she averages 12 points and 12 rebounds for the 10-4 Panthers. She says during the one game the Panthers (10-4) lost with Carrington in the lineup she saw numerous chances to drive to the basket, but she resisted the urge, making the sacrifice, allowing her ACL to fully heal. The goal is simple — win enough games to qualify for the Open Division in the playoffs when she hopes she’ll get the go-ahead for contact. With fellow ACL injury victim Mariana Ecija, a transfer from La Jolla Country Day, also back, a big playoff run is possible for Horizon. She’ll continue her limited role tonight in a Coastal League game against No. 2 Bishop’s, led by Destiny Littleton.